2Twin Box is a dual SIM adapter which allows to use 2 phone numbers active at the same time on your iPhone. This adapter turns your iPhone into a simultaneous Dual SIM smartphone. 2Twin Box Dual SIM allows you to make and receive calls, send and receive SMS, all with two SIM cards simultaneously and without having to carry several mobile phones. You can manage your calls and messages on two phone numbers active simultaneously from the screen of your iPhone and centralize all data of your 2 SIMs (phone book, SMS, call logs ...) on one iPhone. 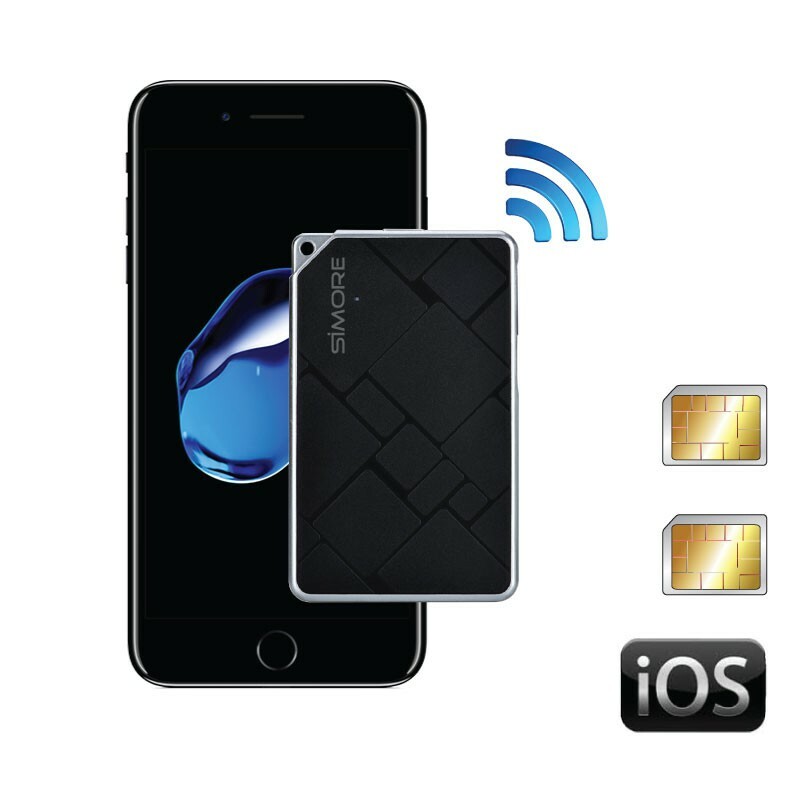 2Twin Box is the slimmest and the lightest Dual SIM Bluetooth adapter with simutaneous connection which allows to have both numbers active at the same time on one iPhone. With its credit card sized format, only 5 mm, and its ultra light weight, 25 gramms, it fits easily in any pocket and always stays with you. Insert your Nano SIM card into the 2Twin Box device. Connect your iPhone to 2Twin Box via Bluetooth (wireless connection). Enjoy the simultaneous Dual SIM phone function. With its simple and intuitive interface, the SIMplus app allows you, at a glance, to select the right SIM card, access your contacts and messages, view your networks information, mobile phone provider, signal strength, the battery level status. 2Twin Box is also a Bluetooth camera remote shutter for your iPhone. The long-lasting battery of the 2Twin Box Dual SIM adapter is rechargeable by micro USB. This Bluetooth adapter is easy to use and without jailbreak. Your iPhone becomes a Dual SIM card smartphone. The thinest, 5 mm only, and the lightest Bluetooth Dual SIM adapter, it weighs only 25 gramms. Credit card sized, 2Twin Box takes place easily to your pocket, your wallet or a bag. Triggers remotely your iPhone's camera for your selfies. Cloud option to be informed of missing calls and SMS even if 2Twin Box is disconnected. Can I use all SIM cards sizes into the 2Twin bluetooth system ? The SIM slot size of the 2Twin is the nano SIM format. It is possible to turn your SIM card into nano SIM size by using our SIM accessories. What is the battery life of the 2Twin adapter ? The 2Twin dual SIM has its own battery. The battery life is 3 hours of talk time and 100 to 150 hours of standby time.